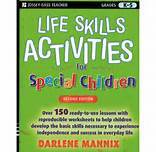 Life Skills Activities for Special Children by Darlene Mannix. Teaching life skills to special children can be challenging to both parents and educators. Use these 145 lessons with reproducible activities to help your children experience success and independence at home, school, and in the community. Pp. 368.